• Like most people, I have worn a red poppy before and on Remembrance Day, almost as a seasonal reflex. Yet in recent years my enthusiasm for the custom has dimmed, even while my respect for Canadian military veterans has not. The poppy first appeared as a symbol of remembrance of World War 1 in 1920. It was inspired by the 1915 poem, In Flanders Fields, by Canadian physician and Lieutenant Colonel John McCrae, who noted in verse that poppies were the first flowers to grow in the shell-tilled earth of soldiers’ graves in Flanders Field, a region that crossed French and Belgian territory. Paper versions of the flower were first used by the American Legion to commemorate American soldiers who died in World War 1. Military veterans’ groups in the Commonwealth adopted the custom shortly thereafter, before and during their November 11 Remembrance Day commemorations. 1) November 11 commemorates the WW1 armistice: In 1914, a confusing patchwork of national alliances exploded into a land war in Europe, resulting in 37 million military and civilian casualties in just four years. In the meat grinder of trench warfare, the ammunition of opposing sides was worn down by a fusillade of young male bodies. The only ones to profit from this madness were the plutocrats, industrialists and demagogues of the warring nations, along with oil barons focused on the “Great Game” in central Asia. There are very few surviving World War 1 veterans. The day that commemorates the armistice and the astounding courage of the era’s soldiers also validates one of humanity’s greatest catastrophes, one that set the stage for the Holocaust and World War 2 a few decades later. At its outset, the custom of poppy-wearing honoured brave young men propagandized into killing other brave young men. Hitler, a failed watercolour painter with a brush moustache, won over the German people with his petit mal oratorical style. He expertly captured and channelled their nationalistic resentments and ethnic bigotries with his charismatic lunacy. But he was also aided and abetted by western interests, just as similar interests supported the rise of Saddam Hussein in Iraq a half-century later. 3) The red poppy does not honour the sacrifice of other soldiers: Combat soldiers on the ‘wrong side’ of any given conflict are invariably seen as losers in terms of their state/social programming, to say nothing of actual defeat. Yet they can also be seen as heroes in terms of personal sacrifice, beyond the ‘rightness’ or ‘wrongness’ of their cause. For generations, courageous people have been propagandized into fighting for God, Pope, Emperor, King, Queen, Kaiser, Reichsfuhrer or a set of lines on a map. The real causes usually involve resources and territory. 4) War is toxic to democracies, even for the victors: “Until August 1914, a sensible, law-abiding Englishman could pass through life and hardly notice the existence of the state, beyond the post office and the policeman,” noted historian A.J.P. Taylor in English History 1914-1945. The First World War altered the dynamic between citizen and state, and not just in Britain. The US Sedition Act was passed in May of 1918, mere months before armistice. The Act was later used as a tool for the arrest, imprisonment, execution and deportation of dozens of unionists, anarchists and communists. It became a bludgeon used to criminalize “antipatriotic’ and “antiwar” speech. There was also the post-WW2 fallout on the US press, as noted by Ben Bagdikian, Dean Emeritus of the University of California, Berkeley Graduate School of Journalism. “The incestuous relationship of the Monopoly Media Cartel and psychological warfare has a long history. Veterans of World War II, for example, the US Army’s Psychological Warfare Division, became the Cold War’s media giants. OSS agent William S. Paley became a CBS executive. C.D. Jackson [an expert on psychological warfare who served in the Office of Strategic Services in World War II] worked at Time/Life…William Casey was an executive at Capital Cities, which merged with ABC and subsequently devoured by Disney. Casey himself, of course, became Director of the CIA,” Bagdikian observed in his 1983 book, The Media Monopoly. In the US, the growth of the military-industrial complex has run in tandem with increased domestic surveillance, decertified unions, the militarization of police departments, the infiltration and monopolization of the independent press, the sacking of Treasury finances and the concealment of state and corporate crimes under the banner of national security. These trends have accelerated since 9/11. 5) There is no glory in war: If there were, the sons and daughters of the rich and powerful would be the ones on the front lines, not the cannon fodder drawn from rural areas and small towns. Young people with minimal employment options sign up for the armed services; the lucky ones get an education behind the lines, while the unlucky ones get theirs in dustblown hell-zones. A quarter of the returning soldiers of the Bush-era wars, Canadians and Americans alike, have experienced mental health problems ranging from suicidal thoughts to unmanageable anger or some other variant of PTSD, with the prospect of diminishing post-combat support from their governments. 7) Civilian deaths far outnumber soldier deaths: The civilians, who died as a result of the wars, official or undeclared, of the 20th and 21st centuries, outnumber the casualties of soldiers by many tens of millions. Needless to say, there is no holiday to acknowledge the involuntary sacrifice of these mostly forgotten souls. 8 ) There will be no ‘World War 4’: When historians began to optimistically number World Wars, it was a clear sign of a need to rethink a Sesame Street approach to global conflagrations. Thankfully, the US government and NATO forces recently pulled back from the brink in Syria, but it was disturbing that Kerry and Obama were so willing to play chicken with Syria’s ally, Vladimir Putin – especially given today’s crazy quilt of geopolitical alliances, reminiscent of Europe just prior to World War 1. I can’t support a seasonal sentimentalism about war that doesn’t explicitly condemn its potential for human extinction. As expatriate British singer/songwriter Ian Hunter observed in his song Flowers: Hunger, anger, propaganda / Ain’t it time we all grew up?… / Mass confusion, disillusion / Sometimes flowers ain’t enough. 9) Canada’s militaristic posturing: In recent years, Canada has transformed from a ‘soft power’ to a belligerent presence at the UN and on the world stage. The House of Commons has turned into an echo chamber for US militarism. The Canadian military directs special forces to Mali and other far-off trouble spots. Foreign Minister John Baird behaves like the squeeze toy of Israel’s President Netanyahu and the Royal Mint issues coins commemorating the battle of 1812, in tandem with government-sponsored television advertisements for the same. Only a scathing report from the Auditor General and public outrage sidelined Harper’s plans to spend billons of taxpayer dollars on F-35 jets, which have no defensive purpose whatsoever for Canadian territory and security – even under the questionable assumption these wonky weapon platforms will work as advertised. 10) Poppies’ other connection to war: The poppy bulb is the source of opium, a narcotic drug long connected with wars in central/southeast Asia. In the mid-1800s, Britain went to war with China to force the Chinese government to continue importing their opium cultivated in India. Refined into heroin, trafficking of the narcotic has continued to haunt military adventurism to the present day, from Vietnam to Afghanistan. Drugs and war are intertwined in the shadow economy, with the trafficking of heroin and cocaine supplying billions of dollars of liquidity to the global banking system through laundered funds. 11) Thou shalt not kill: I could never figure out how the Sixth Commandment from the Bible jibed with Onward Christian Soldiers and other crusade-friendly memes. Judeo-Christianity is still the dominant ethos in North America, especially among the warrior class hailing from small town America. It’s remarkable that a commandment supposedly written in stone (on Moses’ tablets) is never cited during the media ballyhoo that precedes every military engagement. Every year, Fox News trots out its tired trope about “the war on Christmas,” yet when it comes to Murdoch-endorsed war mongering, somehow forgets the injunction against homicide in its sacred instruction book. Remembrance Day distracts us from the new, automated face of state-sanctioned slaughter, which may depart even further from democratic oversight, or even human control, through the proposed introduction of “Terminator-style” robots and drones. With targeted assassinations conducted remotely by joystick, the red poppy refers back to a kind of warfare that will increasingly be limited to proxy armies and paramilitary contractors. 12) Red poppies have been rejected as wartime Remembrance by one Anglo-American state: Years ago, a vacationing acquaintance tried to enter a bar in Northern Ireland while wearing a red poppy. A helpful local stopped him at the door and advised him to remove it for his own safety. “The poppy is especially controversial in Northern Ireland and most Irish nationalists and Irish Catholics refuse to wear one due to the actions of the British Army during The Troubles,” according to Wikipedia. So there is certainly at least one cultural precedent for rejecting the red poppy. There is an alternative to the red poppy. In 1933, Britain’s Co-operative Women’s Guild introduced a white poppy and white poppy wreaths as pacifist symbols. Seventy-seven years later, the Royal Canadian Legion considered launching a lawsuit if groups in Prince Edward Island and Ontario did not stop handing out white poppies ahead of Remembrance Day. Beyond the questionability of a copyright challenge over an image of a flower, there is nothing to stop people from painting their red poppies white or constructing ones out of white paper stock. There are many thousands of red poppy wearing veterans who march in parades for peace, attend antinuclear rallies and the like. I respect the contributions, past and present (but hopefully not future) of all Canadian veterans, just as I respect any Canadian’s choice to wear a red poppy. I am not arguing in favour of abandoning Remembrance Day, but I am hoping we expand its meaning in our hearts and minds. A new generation could start by refusing to fight for a pampered class of wealthy civilians; those whose children will never serve in front line combat. i was wondering if someone could help me? I am a reporter for Spoke TV in Kitchener, Ontario and I am looking for someone who wears a white poppy near this area, who would be willing to speak on camera for a few moments about the meaning of the white poppy. I would be very grateful. Thank you for your help. Go educate yourself and then rewrite this “article” with facts. The red poppy symbilizes the BLOOD shared by all soldiers who give their lives/limbs in battle. There is no such thing as a white poppy and that is as appropriate as this so-called peace it represents that comes out of thin air or a young naive and sadly mistaken child’s pipe dream. Grow up! There is such thing as a white poppy – Arctomecon merriamii. you, like all the other white poppy crowd have missed the point of Remembrance Day, it is a day set aside to remember the cost of war, that cost is the names on countless memorials on both sides of any conflicts. For some those names are not just an abstract, they are husbands, fathers, brothers, mothers and daughters, it is personal. You will find, once the hatred for those that killed your friends subsides, veterans have a great respect for those they fought, they, like them, were doing their duty as they saw fit. Speaking as a soldier, they’re is only one mission for every soldier, that is to get as many of your friends home as you possibly can, all else we leave to historians and those who were not there. I agree. It seems strange that so many people (mainly civilians) appear to have missed the real reason for wearing a red poppy. Pure and simple it’s not to glorify war but to pay tribute to those who were willing to risk their lives for what they considered an honourable cause – and I include those COs who risked everything as stretcher bearers. I read somewhere, that after WW1, many soldiers on BOTH sides would have willingly turned their guns on their politicians and so-called leaders rather than the enemy, who they eventually came to respect as “comrades in arms”. And as someone from a Britsh military background, I’m inclined to agree. I need to add to my previous comment. I would think that we wear the poppy as a sign of support to our veterans, is it not for them? Or to communicate to vets and others that we are aware of great losses that come with war. Why over complicomplicate it. I don’t know anyone who sees a poppy as a sign that someone supports war. Why not put your time and energy into efforts that might help prevent further deaths, instead of offending vets and their families. You’ve oversimplified. How do you know that the wearer of a white poppy isn’t working to make sure there are no more deaths? For that matter, how many people really do more than pay lip service to “never let it happen again” around Remembrance Day? I didn’t even read your entire article. The ignorance behind this is shocking to me. The poppy has never been about celebrating but a symbol of sacrifice. I assume you do not have relatives who have lost their lives or been prosoners of war. I have both, sadly. I think if you did you would know how offensive this is. I have both. My grandfathers both served in WWII, and one of them suffered from depression and PTSD his entire life partly as a result. My grandmother and infant aunt huddled in the Underground during the Battle of Britain. My husband’s grandfather survived a concentration camp and his grandmother, father, aunts and uncle survived near-starvation in the Netherlands. And my brother serves in the Canadian Armed Forces now. The red poppy recognizes my brother and my grandfathers. But with all the Remembrance Day ceremonies and school assemblies I’ve been to, I’ve rarely encountered one that explicitly mentioned the people like my grandmother and aunt or my civilian in-laws. So I wear both: the red poppy for my relatives who served, convinced to do so by propaganda that mostly didn’t tell them the truth about what was happening, and the white for the civilians who didn’t give what they had willingly, but rather had it torn away. 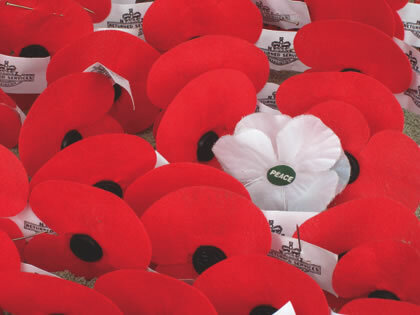 I think I will wear a white and red poppy this year. The red one will be to pacify the ignorant and the white one in remembrance of the Quaker medical core who refused to bare arms. Consequently, they were given special dispensation to form their own unit. The major error in the white poppy campaign and the resistance against Remembrance Day is that Remembrance Day is not a celebration. When is the last time you went to a Remembrance Day Party? We don’t celebrate Remembrance Day, we honour it with solemn ceremonies. We wear and carry flowers and wreaths to remember those who died in wars. The focus of the poppy is overwhelmingly a focus on death by war. You can call that an oversimplification, but death is pretty simple. My Dutch grandparents moved to Canada because Canada saved them from the Nazis. My grandpa wasn’t a soldier, but he was a merchant marine throughout the war and he transported the survivors of Japanese concentration camps from Indonesia to Holland. He cried every Remembrance Day because he remembered how horrible war was. It’s foolish to think you can achieve peace by forgetting the wars. I’ve always understood the opposition to Remembrance Day as an excuse to go to brunch, instead of standing in the cold and seeing how sad and solemn everyone looks. Now, going to brunch seems like a better idea than wearing a white poppy because at least you won’t be making people, who are already somber in spirit, feel guilty for taking time out of their day to think about how terrible war is. You are just apathetic and ignorant. The veteran’s don’t set policy. all they do is serve. They deserve recognition in perpetuity for their sacrifices so that morons like you can slag them for their masters flaws. Obviously you were never a soldier. Someone who writes a couple thousand words on a topic, complete with detailed historical references and links, can hardly be accused of apathy. This article represents a minimum of several hours’ work, and probably a lot more. The apathetic person is the one who doesn’t wear any poppy, because they just can’t be bothered. John Stuart Mill once wrote: “War is an ugly thing, but not the ugliest thing; the decayed and degraded state of moral and patriotic feeling which thinks nothing is worth a war, is worse.” These words come to my mind when I see fellow ¬clerics sanctimoniously wearing white poppies and turning the nation’s symbol for selfless sacrifice into a political pawn. Wearing a poppy is not a comment on military intervention, and the men sent out by our government do not bear responsibility for such decisions but do bear the consequences. The ratio of injured to dead is around 15 to one so with 445 soldiers killed in Afghanistan, some 7,000 soldiers have been wounded – many hideously mutilated and maimed for life. My soldier son returned recently from that benighted land and if you want bitter realism about the futility of New Labour’s silly wars you should talk to a serviceman. But the fact is we elected Tony Blair as we elected that incompetent pair Herbert Asquith and Edward Grey who tumbled us into the First World War and the poppy stands for sacrifice not political idiocy.